With a little planning and help from Resene you can rejuvenate your living space in a weekend for $200 or less! Tired of your current living place? Planning to move, but now find you’re staying put longer than intended? Don’t despair. If the prospect of redecorating seems daunting, start with an easy project and work yourself into the bigger jobs. At the very least a clean and declutter will work wonders and then once things are cleaner and emptier, it may be easier to decide on what your next step is. Whatever you do, it is your space so make sure it reflects what you like, your taste and your style – after all, you are the one who has to live with it. And when you start to feel bored of the space, just redecorate! A good spring clean can do wonders. Thoroughly clean everything from windows to curtains and dust off all your collectibles that might escape more regular cleaning. Attack those cleaning jobs that seem ‘too hard’ – it’s surprising how often they take less than half an hour to finish with generally the only cost being a little bit of cleaner and some elbow grease. If your paths and driveway outside have become home to lichen and the like, apply Resene Deep Clean, following the instructions on the bottle, and leave to do its work. Resene Deep Clean will, over time, work with the weather to loosen the lichen resulting in cleaner paths. If you’re too impatient to wait for this, try Resene Paint Prep and Housewash for an instant clean on exterior surfaces. It’s ideal for all painted areas outside, so you can give your house a clean at the same time as your paths. Don’t forget to clean the soffits – they are generally protected from the rain and can accumulate a lot of dirt. Another handy tip to rejuvenate your driveway is to waterblast it. Hire a waterblaster for a day or a weekend from your local hire store and get going. Waterblasters these days are generally easy to run with no experience needed. You’ll be amazed at how much newer your driveway will look once you have finished. If you’ve finished the outside or that seems a bit of a daunting place to start, then cleaning fingermarks off your walls inside can also make a huge difference to how fresh your home looks. Grab yourself some Resene Interior Paintwork Cleaner and carefully clean off marks following the instructions in the Resene Caring for your paint finish brochure. Consider hiring a carpet shampooer regularly. It can do wonders in keeping your carpet looking its best for longer. Most people accumulate items, so it pays to regularly declutter your living space. This doesn’t just mean putting things away in a cupboard; it means getting rid of things that you don’t use! Things that are getting in the way, detracting from the room or are just collecting dust – get rid of them. You’ll feel a lot better after you do! And these days, having a good clean out can be a good way to make money if you sell unnecessary items on websites like trademe.co.nz. You can then use the money you have made as a reward for the decluttering or invest it into a makeover of your decluttered home. Charities like the Salvation Army are always looking out for good condition used items, so if you’d rather donate than sell, check out your local charities. Many of them will come and collect for free. It means that your once loved items can get a new lease of life in someone else’s home. If you are one of those people who hates throwing things out, consider lending things to family members who may have a use for them, or else put a date tag on unused items… if you haven’t used it within six months you probably won’t, so consider selling or donating it to someone else. Eliminating clutter can make a previously cramped house feel positively huge and provide some extra income from selling unwanted items. Change your space simply by moving the furniture and the accessories around. Anyone who has moved furniture and storage units around will know how easy it is to create new open spaces. If you’re working on the living room, try not to arrange your room so the traffic runs directly through your conversation area otherwise you’ll find that your conversation is interrupted each time someone walks through. Swap furniture and accessories between rooms to maximise space and storage. And if you are moving the furniture you can also move the rug at the same time to suit the new layout. If you want to splurge and don’t have a rug, now could be a great time to buy one. Best of all, if you do decide to move at a later stage you can simply roll up the rug and take it with you. And next time you undertake furniture rearrangement, you can pop the rug into another room if you want to. 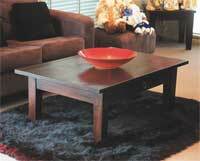 Rugs can also be a handy way to cover up unsightly stains on carpet without needing to replace the carpet. This works well if the stain is in the middle of an area where rugs would often be placed. Rugs are also a useful way to define spaces – such as conversation areas in your home in larger open plan areas. If you have off-cuts of your carpet, consider taking them to a rug shop and getting the edges finished. They can then become useful mats for entry and exit points – particularly in ranch-slider areas leading to decks, saving your carpet from stains or covering up stains that might already be there. Also a great idea for a kitchen with a tiled or hard floor – standing on the hard floor can make your feet sore (and cold in winter). Adding a rug made out of your carpet will keep your feet warm and comfortable without clashing with your home. One way to get a new look with minimum investment is to repaint the room. If the ceiling and trims are in good condition, then just concentrate on the walls and make sure you mask them well so you don’t damage adjacent areas. If you’re planning to paint but leave the rest of the room furnishings unchanged, then make sure your paint colours will match the existing items. You can either tackle the whole room or even just focus on a feature wall. If you feel creative, try out paint effects techniques, stencilling or have a go at creating stripes by masking out areas to paint in different colours. The best thing about paint is that if it doesn’t turn out quite as envisaged, you can paint over it. Outside, consider repainting your front door, garage door, letterbox and feature pots and planters if you are after a quick new look. Staining your deck and wooden furniture (or giving it a lick of paint if painted) can also do wonders for the entrance and entertaining areas of your house. Check out the Resene garden projects for some ideas to get you started. The larger the area being decorated, the greater the impact, which is why paint can have such a striking effect because one can of paint can go a very long way. 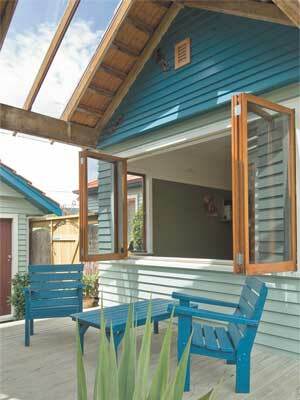 Check out the Resene DIY tips for some handy painting and decorating suggestions. And grab yourself a Resene The Range 2009 fandeck. It has all the latest Resene colours plus tips on matching the colours you like with complementary ones to get a complete look. If your room is looking a bit hodgepodge, then it’s time to decide on a focal point and centre attention on that. This may be the wall behind the bed, or a fireplace wall. Focus your attention on that space and create a feature area. 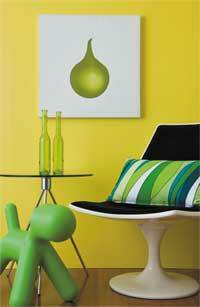 Consider using a fashion colour or striking colour for the wall. 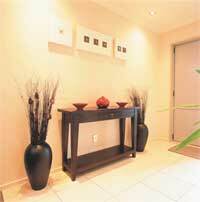 Then choose appropriate artwork or accessories to complement it. A simple colour change on one wall can make an incredible difference to the room without a lot of work or expense. If your room already has a good focal point, then painting the entire room can freshen up the look without detracting attention. A few fashion coloured cushions, a new ornament or vase, can do wonders for the look of your room, and requires minimal effort apart from some wandering around stores to find the right item. Or refresh your favourite photos by investing in new photo frames or switch the frames around on existing photos so different frames are in different rooms. If you like the frame design but are tired of the colour, use Resene testpots to repaint them to a new colour that suits the room and the photo. If your bathroom is feeling bland, consider adding a feature wall and some coloured towels and accessories to hold toothbrushes, toothpaste and the like. Because bathrooms are generally small spaces, it doesn’t take much to liven them up. Make sure you choose good quality towels and accessories. 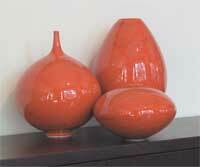 Try to choose accessories that are not overly detailed, as simpler designs can be easier to keep clean. In the dining room, a new tablecloth or table runner and decoration can rejuvenate the space quickly and easily. If your sofa upholstery is looking tired but you can’t afford to invest in new furniture, consider a slipcover. You could even use a king size sheet. Throw the sheet over the furniture, tuck it in and then tie up the front and back corners with ribbon or lace. This is a great option for those with kids and pets as the cover or sheet can be thrown into the wash and a new one placed on the furniture protecting the furniture underneath. 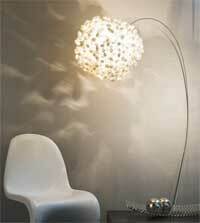 It is also a very quick and easy way to change the look of a room. 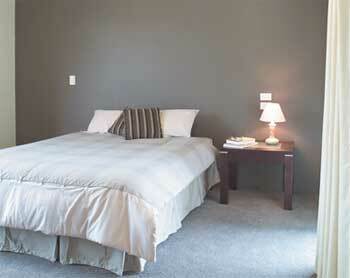 Similarly in the bedroom, the duvet is generally a key feature of the room. Buy yourself a new duvet with colour or texture and see what a difference it makes to the space. If you have furniture, such as chests of drawers, that you like but that don’t fit your room colour scheme, consider repainting them. Generally you can get this done in a day with minimal paint. Or if you want to go for an antique look, try out some of the Resene Paint Effects techniques for an aged effect or crackle effect. This is also useful if you need more furniture but can’t afford to buy new. You can purchase second hand furniture from garage sales or online, and then refresh them with colours to suit your home. They’ll look as good as new at a fraction of the cost. In the kitchen, the cabinetry tends to dominate, so it’s often the best place to start for a fresh new look. Cleaning and painting the cabinetry doors and replacing the handles with something more modern may be all you need to makeover your kitchen. Or you could consider removing a few doors and turn them into display spaces, either with a neutral coloured background or splash out with a bolder colour. If your room is feeling a bit lifeless, add a plant or two, or even three, to breathe some life into the room. Plants can also be good for the indoor air quality. If you’re not green thumbed, then choose hardy options that require minimum attention or consider quality silk options. These days the quality is so good that many are hard to detect from real ones. And if you are overrun with pets and children or are often away from home, then quality silk greenery is a great option. That way, if it gets knocked over there will be no dirt to clean up and you’ll be able to put the greenery back where it came from. If your paintwork is in good condition but your room still needs something more, a wallpaper border may add the interest you are after. Wallpaper borders are available in a wide variety of designs and are particularly popular in children’s rooms to incorporate their favourite things without repainting the whole room. If your walls looking a little barren but you don’t want to invest in expensive artwork, why not create your own? You can now buy pre-primed artist canvases at very reasonable prices from a whole range of stores. You don’t need to be an artist to create striking works, sometimes a series of canvases each painted a different colour or colours with a bold geometric or splash pattern is all you need to jazz up a room. And if the room colours change in the future, you can simply repaint the canvases to suit. If you have children in the house, this is a great way for them to get involved. Paint a base colour onto the canvas to suit the room scheme and then select some other colours for your child to work with. This way the colours won’t clash with the room colours and you’ll have a very special artwork keepsake. Alternatively check out the Resene art projects for some ideas to get you started. There are projects suitable for adults and children, so you can select one that suits your skill level. Family photos and artwork can also be transferred onto canvas, by canvas art companies. These can be an ideal way to create a striking work of art for the walls using favourite family keepsakes rather than hiding them away in albums and drawers. Open up your living areas with mirrors. Mirrors can make a small space seem much larger. 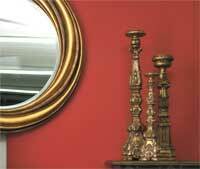 When hanging a mirror make sure you place it so that it reflects a pleasant view – not a blank wall or a closet door. Make sure the mirror is at a height that won’t cut the head off tall people. That’s considered bad feng shui! An interesting lamp or candle selection can add interest to a space, particularly if you select something bold or unique. They can become a talking point and late in the evening can make a nice change from strong overhead light. Whether you decide to clean, declutter, paint, light or cover, you can create a whole new look without blowing the budget.